Prime Minister and FijiFirst Leader Voreqe Bainimarama says he will continue to speak about what happened during the 1987 and 2000 coups because there was a lot of inequality in the country during that time, and he does not want Fiji to go back to those days. While speaking during a campaign meeting in Nausori, Bainimarama made it clear that he is not scaring people but he is speaking facts. 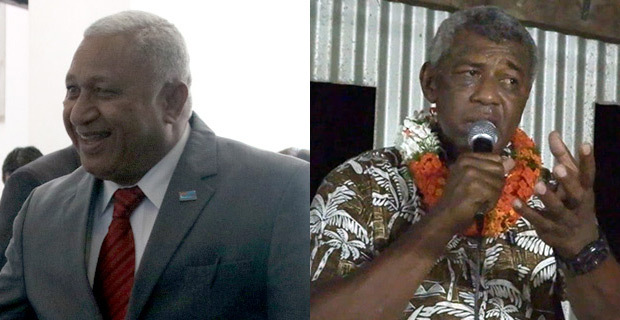 Although National Federation Party President Pio Tikoduadua has said that Bainimarama is campaigning on fear, Bainimarama says the movement that he started was to remove inequality in the country and he will continue to talk about it as he does not want Fiji to go back. Bainimarama also says that those in NFP do not have to worry if Fiji faces issues as they have a lot of money and will fly out of the country. He also shared a story about some top businesspeople who wanted him to remove the Qarase led government back in 2003 and 2004. Bainimarama says he will not reveal the names but some of these people are now supporting NFP. Meanwhile the President of the National Federation Party Pio Tikoduadua says Fiji needs a change because the current government has been in power for 12 years. While speaking at a NFP campaign meeting at Navitoko, Sawani along Princes Road last night, Tikoduadua said that the leadership that is being portrayed at the moment by the FijiFirst Party especially by the Prime Minister and FijiFirst Leader, Voreqe Bainimarama’s utterances in the last few weeks is very concerning. Tikoduadua says that he wants to say to the Prime Minister that this is enough of his threats and to let the people enjoy their freedom that the Prime Minister purports to be giving to people in Fiji today.